Congratulations to our phenomenal 3rd grade ELA teacher, Mrs. Massandra Griffin, for being selected as our 2018-2019 Teacher of the Year. Congratulations again boys and girls! Although it was Thanksgiving break, this group of boys and girls still wanted to meet their weekly iReady goals! They decided to log in at home to get the job done! Congratulations boys and girls! Your hard work didn't go unnoticed! 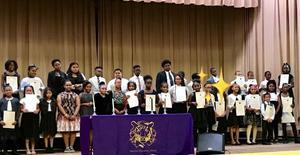 Congratulations to these 35 bright inductees! Congratulations to 5th grader, Juan Contreras, for scoring the highest possible points on the state MAAP assessment in the area of Math. Way to go, Juan! Keep up the great work!